LOCATION: This trial was located on the southern end of the Peninsula of Currituck County in the township of Harbinger, North Carolina. Five species of native plants were purchased and then were propagated by cuttings and rooted under a time mist system. Landscapers have an expressed of need for native plant material that can use in our coastal environment, and through this trial to date, the demand for these plants have been excellent. Three species grew very well and 115 of the ones produced were sold the first year. Once stock plant numbers increase, it definitely appears this could a profitable enterprise for nurseries in the business of producing native plants. An educational field day and tour of the propagation trial was held with 22 Master Gardener Volunteers and other quest in attendance. 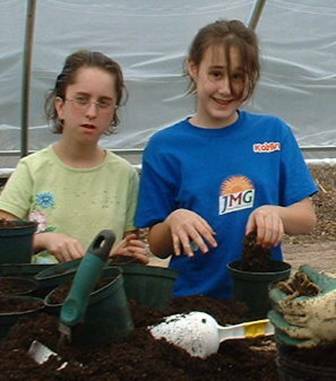 In addition, an activity for 5 Junior Master Gardeners and their 2 leaders was held. The junior Master Gardener heard a presentation on native plants showing their uses and benefits in the environment. They concluded their activity session by actually planting cuttings to be introduced to the time mist system. Extension cooperator, Sandy Sanders conducted this trial at the site of her nursery located approximately 500 yards from shore line of the Currituck Sound were many wetland plants grow in the natural habitat. Certified stock plants were purchased from a licensed grower and were propagated for sale to local garden centers and landscapers, and stock plants for later production. The plants selected for this trial are: Solidago sempervirens (Seaside Goldenrod), Lobelia siphilitica (Great Blue Lobelia), Eupatorium purpureum (Joe Pye Weed), Amsonia ciliata (Narrow Leaf Blue Star), and Asclepias incarnata (Swamp Milkweed). The trial began with six plants of each species. 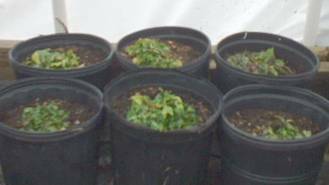 Upon receipt in the spring, stock plants were re-potted into three (3) gallon pots and fertilized. 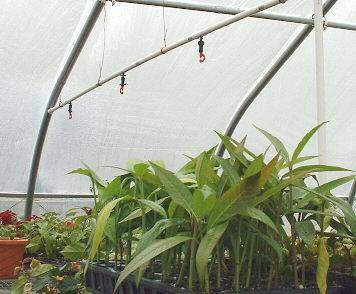 Propagation was done by cuttings, and division of at least one species will be done after a full growing season. Spring and summer cuttings were rooted in 50% shade under a timed mist system in cell flats. Once rooted, they were re-potted into two (2) gallon pots and grown to a marketable size. Marketing of plants were and will be wholesale to local garden centers and landscape businesses in the area. Markets are already known for some of the species of plants in this trial. Plans are to add value to these plants through promotion to floral and craft businesses at a later time. The propagation of the different plant species was performed by stem and heal cuttings as well as a few basal cuttings testing both liquid and dry rooting hormone. The cuttings were placed in a small shaded greenhouse and propagated under a time mist system that came on for two minutes every two hours. The complete results will not fully complete until later this spring, however it is felt that excellent results was produced by this trial. Propagation: All cuttings responded well to methods used. Success to failure ratio between liquid and dry hormone was insignificant in first round of cuttings, so subsequent cuttings were dipped in liquid hormone for convenience. Problems: Fertilizer burn occurred with the first fertilizer that was used, so it was replaced, and with subsequent fertilizing, a turf type fertilizer with an anti-burn agent was used. Milkweed bugs were a definite insect pest problem on the Asclepias during the summer in the nursery, which is next to a swamp or marshland near the Currituck Sound where native milkweed grows. The milkweed bugs were most likely attracted by the concentration of the milkweed in the nursery. However, 18 plants that were moved just a half mile away, did not attract the milkweed bugs. Distance made a difference with this problem. Public interest: Tours of the nursery and talks about the plants in the project held the interest of the participants and prompted questions primarily about the association of native plants with butterflies and the carefree cultivation of native plants. Sales: Landscapers and nurseries were eager to present the plants to their customers and reported repeat sales of Asclepias and Amsonia. Wholesale prices for all plants were $5.00 for a 2 gallon container, retail prices varied from $7.50 to $12.00. Comments: With the dedication of the cooperator, the trial has gone very well, and holds terrific promise during the upcoming spring and summer with more production and sales to come. This was a great learning and educational experience for those involved, and for those people who were able to tour and observe the trial. 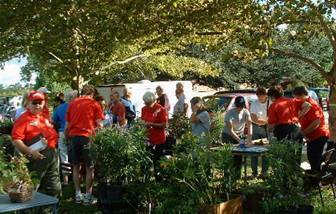 The Currituck Master Gardener Volunteer experimented with the sale of a few of the donated plants during the fall plant sale. The plants were well received by the public.